Just yesterday i made this post about Alicia 2.0 Frontier test with lots of screenshots and info, and here i am back with more stuff about Alicia 2.0 (앨리샤 2.0). 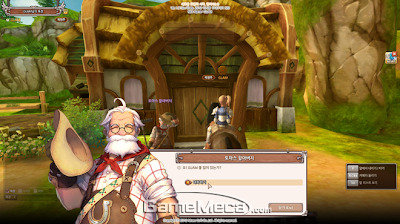 I accidentally stumbled upon a great source of Alicia 2.0 info stashed on a great Korean gaming website GameMeca, and among other things, they wrote a preview for the new version of Alicia Online based on the Frontier test i mention above. The preview has lots of info and screenshots, and i did my best to translate it. It’s not a literal word-by-word translation, you see, as i had to use 3 different translation tools to get the best picture of what is it they’re writing about, but i’m positively sure i preserved most of the info. My own notes are in [brackets]. So, here it goes. 2.0 means the new beginning for “Alicia: The Story of my Horse” (hereafter “Alicia”), with its testing closed at 31st of the last month [October]. 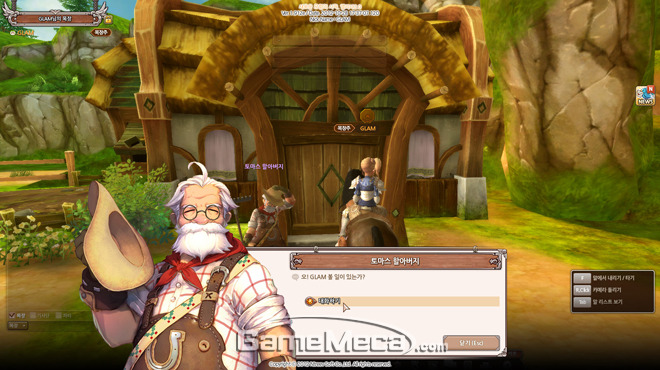 Alicia has horse races where players can compete or collaborate, “Sympathy” system (horse exercises or games) and a housing system where a ranch is built and decorated. ["Sympathy" - "교감", according to dictionary, also "act of joining, sharing"]. In last February, popular Korean singer IU was picked as a model to promote the official launch of Alicia, which attracted a lot of attention from public and gamers alike. But such popularity did not last long. While there were “sympathetic” elements in the game [i.e. feeding, grooming, etc. ], they were only addition to the racing part – simple running as fast as you can to get to the top ranking is what all racing games are offering. Only a handful of gamers enjoyed “sympathetic” content, and a breeding frenzy to get your own pony didn’t last long either. Apart from “sympathetic” elements, and the core content of the game [racing] there was nothing much else to do. Since the game’s official launch, progress of adding new content was quite slow: there were occasional events, but nothing much new. The fans were slowly disappointed and left to play new mainstream games [published after Alicia came out]. In such a situation, Alicia needed a major content overhaul is what the game needed, and here it is – Alicia 2.0, a major leap forward in the direction of new content. Indeed, it took a long time to prepare. Could a racing game re-emerge like phoenix with flapping wings? I tried to play and find out. 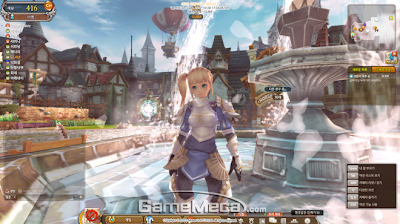 In Alicia 2.0, the main content of the game is now gathered at a Plaza – a place where a Riding School is and a variety of quests are, and where players can go out on a shopping-spree. In addition, a variety of activities are provided for gamers to partake in as a community. The old ranch that players owned looks small and outdated compared to this huge place bustling with activity, with gamers and new NPCs alike. The location is designed in warm green colors agains a blue sky backdrop, with tastefully decorated village houses adding a fairy-tale feel to the whole setting. Even those games who already been to Alicia should be impressed with the new look. With addition of the Plaza, will the old Ranch be completely abandoned? Not really. The Ranch is the only place where a mating system allowing colts to be bred and born works, and the Ranch can now be decorated, adding a housing element to it and making the whole thing much more attractive. As mentioned briefly above, the Plaza holds the Riding School and shops. 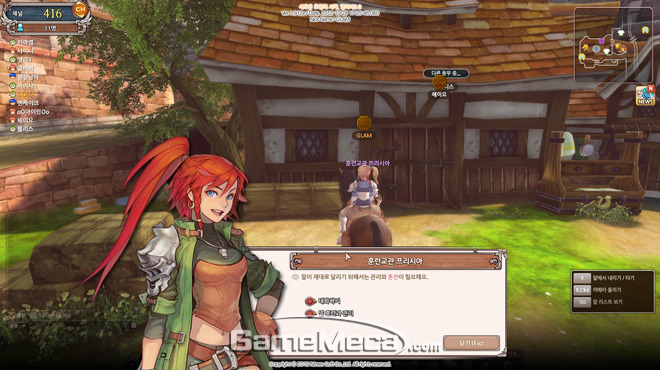 In the Riding School, NPC provides basic riding knowledge for new players, and reward for finishing the first riding quest are items purchased for Carrots [money normally sold for cash] and training cards. The downside of the game is the quest system that lacks any difficulty. There are barely any other themes besides “go race” or “gather a few items”, and not only the content is repeated, there are some parts that are simply boring. There are storyline quests in Alicia 2.0, but in order to play competitively you don’t need to do them. In addition, the quests are way too easy, as the game itself. By default, now you can get on your horse and get off of it, but a variety of other actions are available as well (by pressing F button). By standing next to the horse and using a specific item, for example, it’s possible to wash the horse, which not only ensures horse’s cleanliness, but also would be affecting its physical conditions. The “Sympathetic” system, as stressed early from the beginning of Alicia 2.0 development, is what adds personality to this game. Ability to get off the horse, added dependance on status of the mini games, and other new things to do at the Plaza are adding as much fun as the racing part of the game. Now, the preview isn’t finished at this point, there is Part 2 here. If you happen to know Korean, i would be very glad for a better translation or any other contributions you might have to offer us, Alicia Online fans! Actually, Alicia is far from being popular ever in South Korea right now, and they didn’t even release the 2.0 changes described in this article – for the fans 2.0 appeared to be a major disappointment so it went back into development, and they spent a year on it even before that. Probably Japanese release was based on 2.0, too (though i don’t know that).